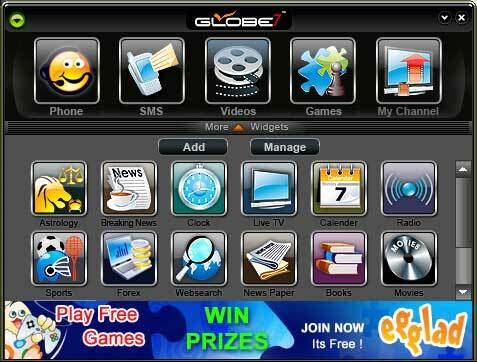 Globe7 is a free downloadable soft phone which enables you to make calls from pc to pc, pc to mobile and pc to landline. Globe7 offers you a free phone number to make free PC-to-PC calls and receive free incoming calls from any phone. Globe7 virtually converts your pc into a second phone. Globe7 also offers outstanding features such as Video Call, Follow Me Service, Voice Mail, Video Chat, MP3 Player, IPTV, FM Radio, Video Streaming and Fax. Globe7 also offers outstanding features such as Video Call, Follow Me Service, Voice Mail, Video Chat, MP3 Player, Video Streaming, Fax and Online Search. The peer to peer Video Call facility enables you to call your Globe7 buddy with live video action in progress. Globe7 Follow Me Service enables you to get calls redirected to your landline or mobile phone when you are not online. You can also receive voice mails to your e mail When you are offline and unable to answer your calls. Through Globe7, you can have a live video chat with your Globe7 buddy. More than that, you can call your buddy's Globe7, mobile, home or office number with a single click even while chatting. You can also listen to your favorite music through an MP3 player embedded in Globe7. You can add your favorite songs to your Play List and listen to them even while you chat with your buddies. FREE Worldwide secure communications for voice, video, text and file transfer. Visual Basic RS232 serial port communications component library. Qweas is providing links to Globe7 9.2 as a courtesy, and makes no representations regarding Globe7 or any other applications or any information related thereto. Any questions, complaints or claims regarding this application Globe7 9.2 must be directed to the appropriate software vendor. You may click the publisher link of Globe7 on the top of this page to get more details about the vendor.